Nipsey Hussle performs onstage at Live! Red! Ready! Pre-Show, sponsored by Nissan, at the 2018 BET Awards on June 24, 2018 in Los Angeles, California. 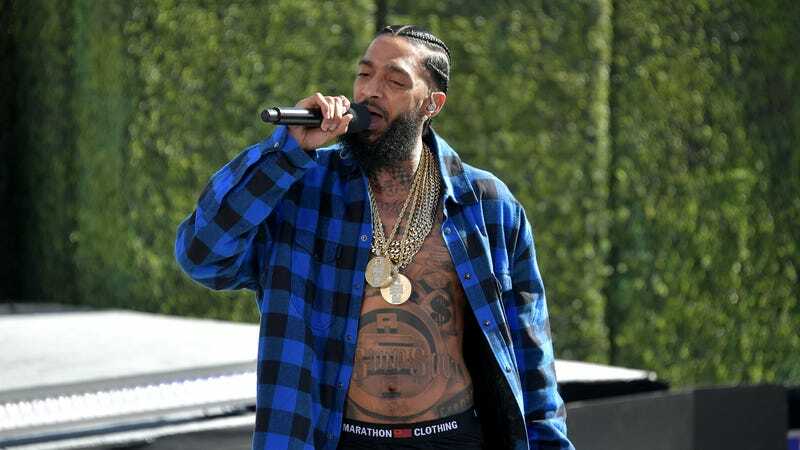 As fans, family, loved ones and Los Angeles residents alike mourn the tragic killing of rapper and philanthropist Nipsey Hussle, new investigation information has surfaced. The LAPD has identified a suspect, named Eric Holder. Holder is 29 years old. Shortly before news of a suspect came about, 19 people were injured and transported to hospitals following a stampede at a vigil held for the 33-year-old artist outside of his Marathon Clothing store, NBC News reported. Though there were initial reports of gunshots, authorities confirmed they found no evidence of gunshot wounds. Additionally, an autopsy report via the L.A. County Coroner’s Office confirmed Hussle died of gunshot wounds to the head and torso. The coroner’s office performed the autopsy on Monday afternoon, and confirmed that the manner of death was a homicide. More details will be available when a full autopsy report is released. Hussle, born Ermias Joseph Asghedom, died at 33 years old. LAPD Chief Michel Moore also provided a few updates in the department’s investigation, including a possible motive of their prime suspect, Holder, noting he believes the deadly shooting stemmed from a personal dispute between Holder and Hussle. Mayor Garcetti implored impassioned residents seeking revenge to refrain from responding with more violence.